I can’t get enough of food markets, can you? I bet you’re wondering where’s the best one in East Yorkshire. Don’t worry, I’m going to tell you! I experienced it for myself with humongous delicious and mouth-wateringly results! 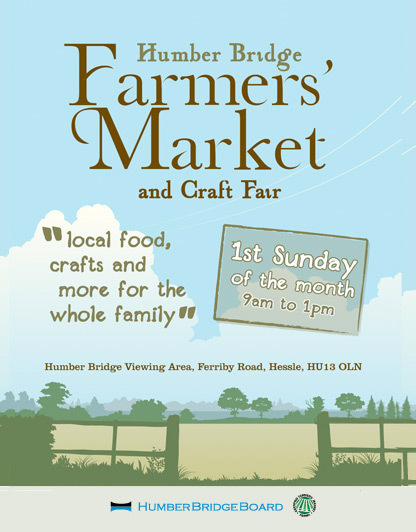 Taking place on every first Sunday of the month between 9am-1pm, the Humber Bridge Farmers Market & Craft Fair showcases a delightful range of delectable selections to over 5,000 visitors each month. As the largest market of its kind in the region, over 100 stalls sets out the best seasonal and regional produce alongside a dedicated area for arts and crafts. So, both my mother and I felt like it wasn’t an opportunity to be missed as we hightailed it down there from Hull one Easter Sunday morning. We had been to the Humber Bridge Viewing Area before when i was young. On the doorstep of the viewing area is the Humber Bridge Country Park where I used to roam within woodlands, meadows, cliffs and ponds. However, we would just have to be content with the Farmers Market as we pulled into our own free parking space only yards away from the event. We just couldn’t wait to sample the Humberside taste! The market was in full swing when we arrived. Greeted first by the finest vegetable produce and pretty flowers handpicked from the region, we were soon in the thick of the action checking out bizarre inventions such as the ‘Doggy Handbag’, where a lead came from, colourful stalls selling anything associated with honey, oversized handmade garden furniture and more. What brought a homely feeling to the market was the presence of dogs within the crowd. Actually, at one point, I thought there were more dogs than people! It really did feeling like a family affair as dogs sniffed each others while their owners chatted with a cup of coffee or Yorkshire Tea. I just love dogs and I could have spent all morning playing with them. But it was the food and drink that interested me the most. What did enter my mouth begs the question? I’ll tell you a selection right now! It was getting on close to lunchtime and my stomach was growling at me. But I came across a stall that appealed the traveller in me. 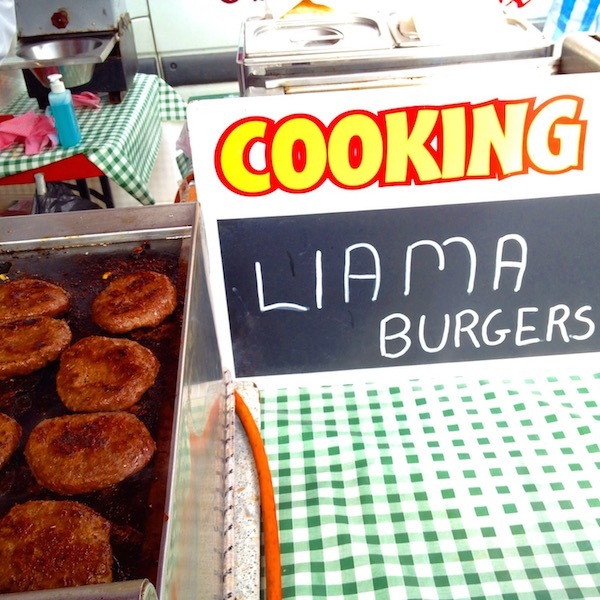 There were three burgers on offer – ostrich, kangaroo and llama. The only burger I haven’t tried is the Llama burgers so I quickly bought that for myself. It rather tasted a bit like venison. But the fried onions that came with it gave it an extra spice. I would have it again but perhaps with cheese? This popular stand by The Yorkshire Venison Centre had the Rex family salivating at its offerings. Big and thick venison steaks were served alongside plump venison sausages that were cooked and grilled at the market. Fresh from their Round Green Deer Farm, you could almost hear the meat bellow. But they did have a selection that caught our eye – Wild Boar Sausages. We bought some to have for our meal later on that evening and we were pretty pleased by the taste. Good pick indeed! Taking a break from all the trooping round of the stalls, both my mother and I treated ourselves to a Rum and Raisin Ice Cream (I say my mother did seeing as she wolfed down most of it!). 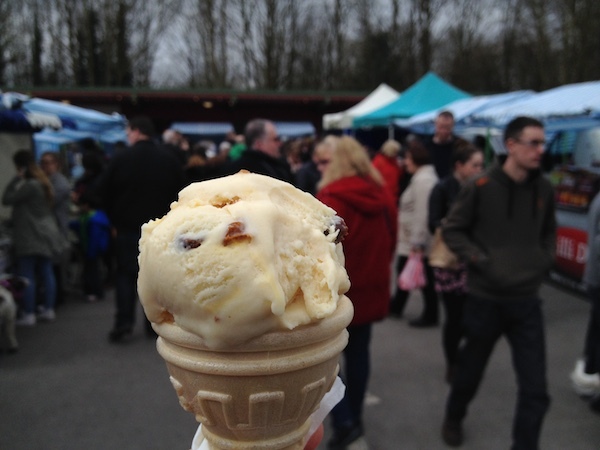 The ice cream was chin slatheringly creamy seeing as it was fresh from local Pedigree British Friesians cows, traditionally made, from Roe’s Farm Dairy in Barrow Upon Humber across the River Humber. I just love olives so much that it’s actually my go to snack. But to tell me that you’ve stuffed goat’s cheese in olives, you’ve got me buying by the bucket load! As I get older and older, I find myself more attracted to locally brewed ales. Everywhere I go in the world, I must have a sample of their local stuff. So it comes to no surprise when I stumbled across Newsome Brewery‘s stall, I knew I had to get one of their regionally brewed offerings. I opted for the Frothingham Best (4.3% abv), a dark amber robust best bitter. 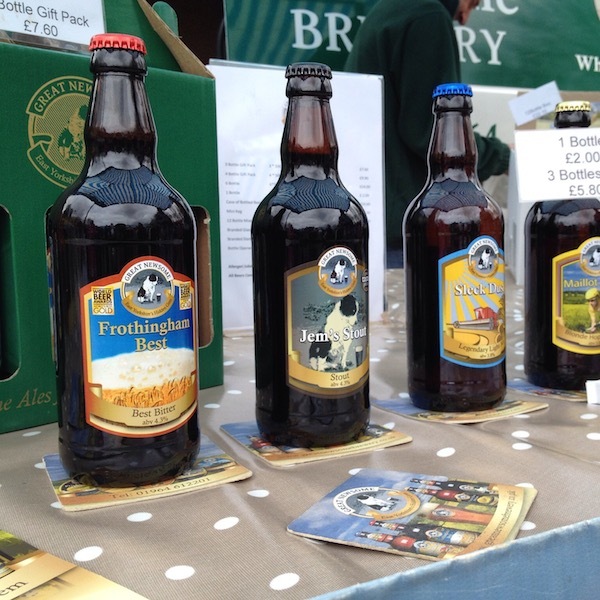 But the real reason why I chose it is because Frothingham is the old name of the hamlet of South Frodingham, where the brewery is based. Not far from Hull, I knew this would be as local as the ale could be. Loved it and worked alongside the wild boar sausages. Actually, the dried pig snouts were for my dog. But I do rather confess that they smelt very tasty! Luckily, I didn’t get a chance to nibble as my dog demolished them within minutes but she did give me a lick on the hand to say thanks! 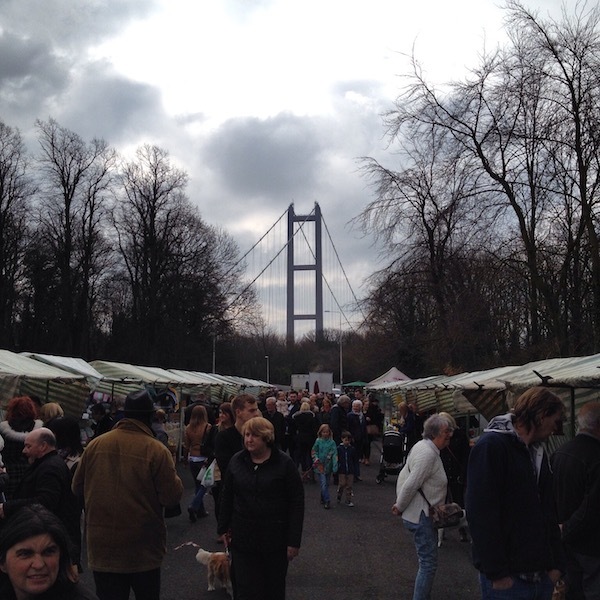 So if you’re ever in the East Yorkshire/North Lincolnshire region on the first Sunday of the month, why not pop by to the Humber Bridge Farmers’ Market to sample the local produce and wares? Go on, I might just see you there. But please don’t interrupt me when I’m lovingly scoffing a sausage…or two. Do you want to read more Kingston Upon Hull Posts? Very good! Where’s there food, we’re there! I’m feeling really guilty now. I’ve been meaning to pop by here for ages yet still haven’t managed it. From the sounds of things I need to go on a fast for close to a day before I arrive – sounds like fabulous food. That reminds me, I still haven’t published my article about this landmark yet! You should definitely visit. Maybe in May?